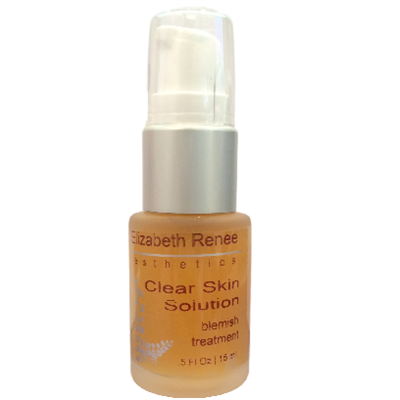 Clear Skin Solution by Elizabeth Renee Esthetics is a time released spot treatment that works deeply in the pores to clear blemishes without being over drying or irritating. It can also be used daily on potential problem areas to control acne causing bacteria and clear away skin clogging impurities. It is especially effective for refining and diminishing post-breakout marks left on the skin after the blemish has gone. Lactic Acid - a hydrating AHA that lightens post-breakout discolorations. Chinese Licorice - targets causes of inflammation to calm redness & irritation. Betaine Salicylate - (Salicylic Acid) provides time-released anti-bacterial exfoliation. Zinc PCA - Reduces sebum (oil) production and promotes healing. Apply one drop to affected areas. Massage in lightly. Proceed with moisturizer or sunscreen.